Are you in need of slow digestion proteins to help you burn fat or fast digestion proteins to you use after strenuous physical activities? Well, you need to know the ingredients of the protein powder and the time to use. The market is flooded with protein powder brands, some original and other exaggerated. Therefore, it becomes difficult to determine the protein powder to purchase, based on your needs. Here is a guide to help you purchase the best casein protein. Who Should Take Casein Protein? Casein protein is simply a complex protein available in dairy products. Some of the foods that contain casein protein are cheese, yogurt, milk and dairy products. Although natural protein is primarily found in dairy, some natural traces are found in seafood and processed meat. However, cheese is the food with a higher concentration of casein protein. Casein protein has several health benefits, because of its slow absorption rate. Casein protein fine powder is processed after extraction from pure casein protein from milk. The ﻿supplem﻿en﻿t is made after addition of additives like sweeteners and flavors. Also, the powder may be mixed with other forms of protein or not. (a) pure casein protein powder composed of flavorings and casein protein. (b) Protein blends that are composed of various protein sources, such as eggs, whey, soy and casein. Supports your body in production of enzymes and hormones. Stimulates the growth and building of muscles. Aids in retention of your mass muscle. Helps in repairing muscle tissues reducing muscle soreness. Enhances your muscle recovery after strenuous exercises. Makes dieting easier while improving potential to burn fat. Apart from protecting and rebuilding, the casein protein repairs your teeth, skin, hair and bones among others. Before choosing the protein powder to purchase, check on the quality. The best quality to purchase is a ﻿﻿﻿pure ﻿and ﻿n﻿﻿atural ﻿﻿protein ﻿powder. Instead of listening the adverts, read the label of the product to check the ingredients and the reviews of previous users. Avoid protein powder that contains over 7 ingredients. Although you should purchase a product that is within your budget, you should compare the cost and the benefits of the protein powder. If a product has extra ingredients that are not necessary to you, avoid purchasing it. Nevertheless, your main intension of taking the supplement should determine the cost of the product you need. You consider the type of supplement you need before purchasing. The supplements include whey isolate, whey hydrolysate, whey concentrate, casein protein and whey protein. Also, you should consider the protein ﻿blends. Among the types, you should consider the rate of absorption and the benefits. You should consider the time to consume the supplement and you should take it. Besides, you should consider ﻿if you need supplement to take after strenuous activity, thus highly absorbed or those that absorbed slowly to act as meal replacements. If you want to increase your ﻿weight ﻿and muscles, purchase protein powders that contain more calories. Alternatively, if your goal is to lose fat, purchase 100% pure protein supplements. 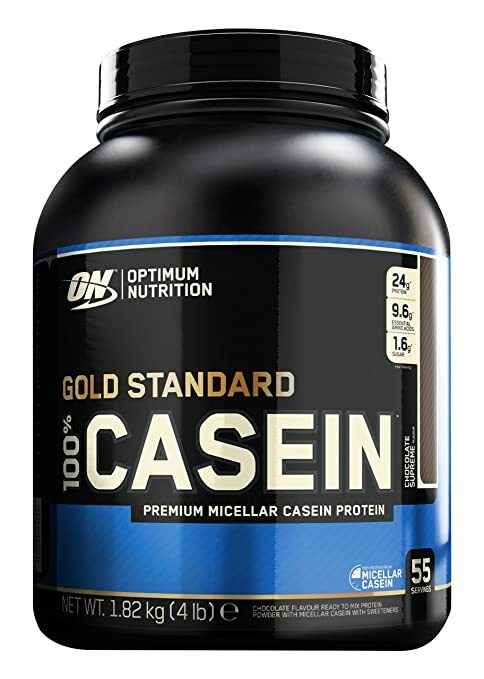 Optimum Nutrition Gold standard casein protein is purely made from Micellar casein. The protein is available in flavors, among them being banana, cookie dough, chocolate supreme, strawberry, natural French, natural chocolate, mint chocolate, creamy vanilla and chocolate peanut butter. Optimum nutrition gold protein is best used before you sleep as your PM protein, and in between meals to increase your satiety. The protein is slowly broken down during digestion, and a scoop contains approximately 5grams of natural BCAAs. Additionally, every scoop has approximately 5grams of glutamic acid and glutamine occurring naturally. Calcium: The amount of calcium content in Optimum nutrition casein powder is very high, thus good for strengthening of your bones and muscles. 100% natural: Optimum nutrition gold standard casein powder is made of 100% natural products. There are no artificial ingredients or fillers that are not helpful to your health. Protein synthesis: A serving of the product contains 23g of casein protein, thus raising the synthesis of protein in your body. Also, the high amount of protein makes it a quality source of your protein requirements. Improves body building: Optimum nutrition gold standard casein protein enhances the growth of muscles, building of muscles and your post-activity recovery. It is slowly digested, thus keeps you full in the entire night. Works well by increasing your satiety levels. Contains less lean protein, making you lose your belly fat easily. The protein is smooth, and mixes well to thicken your shakes. Conventional shakers do not blend well with the protein. Some people hate some of its flavors taste. Musclepharm is the manufacturer of combat casein, an effective and simple casein supplement. The product is among the best casein protein powders available in the market, with a serving containing 28g of casein protein. Also, the casein supplement comprises of a special digestive enzyme, which aids in improving the digestive health, as well as nutrient absorption. Digestive enzyme: The combat casein protein supplement has a unique digestive enzyme that helps in enhancing your nutrient absorption and digestive health. Enhancement of muscles: The protein supplement of the product helps in rebuilding and repairing the muscles. Gluten-free: The supplement is free from gluten protein, making it suitable for users who are allergic to gluten. Also, gluten protein is considered to be unhealthy, thus making the musclepharm combat casein supplement very healthy. Natural casein: The product is made from 100% natural miscellar casein, and there are no additives that are unnecessary. Excellent source of protein: A serving of the product contains 28grams of protein that is digested slowly. Therefore, the supplement is a good source of protein to use before and after bedtime. The taste of combat casein is great. It is an awesome recovery night time protein. High quality protein at an affordable price. Makes an excellent source of protein. All ingredients used are 100% natural, making it a natural product. The chocolate taste is not pleasing to some people, and some say its drinkable while in shaker. The slow absorption rate and high amino acids makes the protein powder famous to many athletes. Also, the phosphorus amounts in the casein protein powder is high, with casein being 80% of the total protein content and whey making the remaining 20%. The effect of the casein powder takes many hours in the muscles, because the amino acids in the supplement gets in your bloodstream at a steady rate, while the casein protein gets digested slowly. Besides, the casein product in the supplement branch chain amino acids, assisting in muscle recovery taking a strenuous activity. Amino acids: The casein protein powder supplement contains high levels of amino acids, making it effective for use, especially to the athletes, due to the slow absorption rate. High amounts of calcium and protein: The levels of calcium and protein in the supplement are high, making it an excellent source of both calcium and protein to meet your daily body requirements. Clean and natural powder: The casein protein used in making the supplement is free from contamination or additives, and all ingredients used are natural, thus the powder is not only clean but pure. Low rate of digestion: The supplement enhances both the growth of muscles and recovery after physical exercises. Branch chain amino acids in the supplement enhance recovery, while the growth of muscles is promote by the slow digestion rate of casein protein. The protein is clean and pure, with no added fillers. High quality product for use during bedtime. The flavor is not sweetened, thus not enjoyable if you love sweetened supplements. Naked casein protein is only made from US farms, and does not contain additives such as colors, sweeteners and flavors. Contrary to other protein powders, there is no bleach, acid and high heat treatment, to make sure important nutrients are not destroyed in the casein protein. Free- skim milk is used in the manufacturing of the casein protein to ensure the micellar casein is release slowly, making it good for use before bedtime. Only available in US farms: Naked casein is only available in US farms to ensure the protein powder is free from GMO, gluten, soy and there are no additives like flavors, colors and sweeteners. One ingredient: The protein powder is made using 100% micellar casein protein and does not contain rBST, rGBH and growth hormones. Cold processed: The naked casein protein is cold processed to ensure chemical detergents do not cause contamination. Among the chemicals are heavy metals, synthetic additives and acid. Natural casein protein: The protein powder does not contain additives, enhancing your total recovery and muscle growth. Highly nutritious: The protein powder has unmatched protein, with a serving containing 5.9g of branched-chain amino acids, 110 calories, 0g of carbs, 2g of sugar and 26g of protein. When mixed with water only, it does not taste well. According to some people, it is hard to mix. Pure Micellar casein: The product is made using 100% pure micellar casein. As a result, a scoop of the protein powder has a higher concentration of protein compared to its competitors. High nutrition value: Platinum 100% casein is highly nutritious, with a scoop containing 4g glutamine, 5.2g of BCAAs and 24g of protein. Better taste and value: The taste and value of the protein powder is better compared to its competitors. Low muscle breakdown: Consumption of the dose daily leads to a decrease in muscle breakdown by 34%. Its quality matches the price. Although the flavor is not great, it is good. The powder is a bit grainy, and it might be rough if you are not used to it. Before purchasing any protein powder, you should consider your sole purpose of purchasing the protein powder and ingredients among other factors. Besides, make sure you do some research on the products you need to purchase to avoid buying a product with unnecessary fillers.